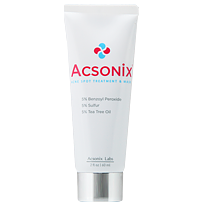 Presenting what they have described as a “revolutionary on-the-spot acne treatment precisely formulated with clinically proven concentrations of the most powerful acne medications”, Acsonix claims to work beneath the surface to kill bacteria and eliminate problem zits in as little as 12 hours! It combines 3 prescription-strength ingredients, supposedly leaving your skin clear, smooth, and free of irritation or other tell tale signs of acne. But it still leaves consumers wondering if any of this is true. Most consumers understandably question whether or not these results are even possible. So let’s find out, can Acsonix live up to these claims? Acsonix ingredients include Benzoyl peroxide 5%, Sulfur 5%, Tea tree oil 5%, Glycerin, and Green Clay among the more notable. First, it is important to note that Acsonix has a powerful 5% concentration of each of its 3 active ingredients. There is no ingredient that can do the job right without certain concentrations, and most will just cause side effects if you don’t use enough. Whether you are talking about sulfur, tea tree oil, or benzoyl peroxide, they have all been clinically proven amounts in this one formula. What Do Acsonix’s 3 Active Ingredients Do? Studied in side by side comparison, tea tree oil and benzoyl peroxide are two peas in a pod. They both act as potent antibacterials, and they both work to flush the pores of harmful dirts, oils, and bacteria. When used in 2.5% concentrations as they are most commonly found, complaints are common. But when used in 5% concentrations each, they provide a different standard of positive acne fighting results. Tea tree oil has also been known for its antiseptic, antimicrobial, and many other positive results. Sulfur on the other hand is similar. But it is not classified in quite the same way. As a component of all living cells, sulfur is an essential chemical needed to code DNA, maintain healthy skin, and properly metabolize antioxidants like alpha lipoic acid. It is however used in skincare for its antibacterial, antimicrobial, antiseptic, and anti inflammatory properties. On their own, the prescription strength ingredients in Acsonix provides some of the most concentrated acne fighting benefits of any over-the-counter acne treatment. Together, we believe that each multiplies the effectiveness of the other, providing faster and more effective results. We would daresay that it may even fight tough zits in 12 hours just like they say. In other words, Acsonix is one of the few acne cures we recommend to be used as a spot treatment for problem zits and acne emergencies as needed.